Camu, which is derived from a rainforest fruit, contains more natural Vitamin C than any other known botanical in the world, and is extremely rich in anthocyanins. Vitamin C and anthocyanin compounds are powerful antioxidants that function as potent free radical scavengers*. It promotes a profound sense of well-being and energy and, like all potent Vitamin C products, helps raise serotonin levels in the brain. Camu also helps to maintain a healthy immune system and a healthy heart and lungs. Researcher Gary Null lists Camu as second on a list of herbs with mood enhancing properties, and first on a list of herbs which strengthen the body's defenses against the herpes virus. * Sixty 500 mg. (100 mg. vitamin C) Camu Camu 4:1 Extract Veggie Caps. 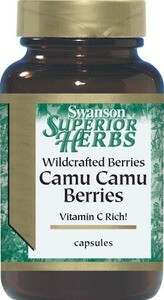 Swanson Health Products' Camu Camu 4:1 Extract powder is an exclusive wild-crafted spray-dried concentrate of camu camu fruit. The spray-drying process allows the powder to attain four times the nutrient and vitamin C concentration of the whole fruit. (Sixty 500 mg. Camu Camu 4:1 Extract Veggie Caps for $11.49.